It coulda’ been a lot worse…. …which is a statement we seem to be saying a lot lately. Lou was admitted to St Luke’s in Maumee tonight with a couple of blood clots in his legs. Good thing he had it checked out at the first sign of real pain…. It appears he will be in the hospital for a couple of days, and then hopefully finally on the mend and getting around without so much discomfort! and Lou is doing pretty well. Amazing what can be done with the laproscopic surgery…..and in such a short time. I think his entire procedue took only about 20 minutes! I saw Dr. Schott and NP Joan today (at U of M) and received a good report. Only I am still so incredibly tired all the time. More research later. Have to sleep tonight to help Lou make it through his knee surgery tomorrow. Yikes! Well, it has been quite some time since I last wrote here. Not because I didn’t have anything to say, that is for sure. But no, it has been due to my newest malady which has proven that cancer is not the only thing that can slip invisibly into your life and create a new daily reality. About a month ago, in late February, I saw Dr. Evans, my general practitioner, for a regular cholesterol check. At the time, I was beginning to feel extremely run down. Just going to school every day was a task that seemed to require a Herculean effort. There were days when I came home that I had to tell myself that I really could make it into the house, and I really could make dinner, and I really could get through the night….if I could just get out of the car… It was a bad time, and I was not able to complete the essentials of work and family life. Each day I felt like I was getting deeper and deeper into a hole, and I was so tired, I could hardly even think. Thankfully Evans included a test for TSH, Thyroid Stimulating Hormone. The blood test indicated that I was extremely hypothyroid, meaning that my thyroid was not producing very much of the important thyroid hormone. Thus the reason for the extreme fatigue. Other side effects were a sudden weight gain, slurring of speech, “choking up” feeling in my neck, puffy in the face, neuropathy in my hands, and very sensitive to the cold. in February. in Ohio. Oh, and depression too. Yea, like I needed that. When nurse BJ called me with the news, I remember being so tired, and thinking, “great. what pill do I need? how in the hell am I going to get to the pharmacy to get it?” Thankfully, the medicine I have seems to be effective, and while I don’t feel great yet, I am so much better than I was a month ago. Except I feel as though I am still “behind” in everything. I can look around my house and see ten things that I am way behind on. The second I wake up in the morning I am working really hard to be super efficient with my school work, but I always, at the end of each day feel as though I’ll never get caught up. It is such a discouraging feeling, and then throw a few technology difficulties in the mix, and well…sometimes it all………..doesn’t get done. It is such a newer, higher level of frustration I get to experience now…..which is why I’ve been spending more time daily in meditation. Lucky for me, I got to see Veronica from The Victory Center twice in her last month there, and she introduced me to a new CD called The Divine Name by Gregg Braden* and Jonathan Goldman**. I can hardly describe the powerful positive effect this particular sound therapy has had for me, except to say that it is awesome. Each night I listen to this recording or the chanting on the “Dali Lama” CD, and many mornings as well. The days I skip this routine, I can tell the difference. More cognitive dissonance. So I try real hard to get to my bed early enough in the evening to listen to these recordings. For so many years I have been chasing the idea of meditation, I am grateful to have finally found a place to begin. 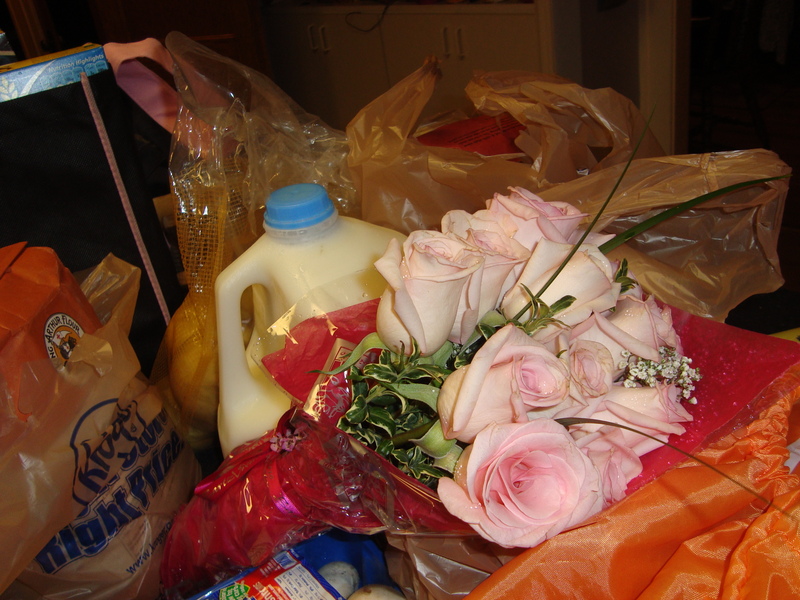 Just another thing I am late in doing….I’d like to thank the anonymous woman who handed me this beautiful bouquet last month in the parking lot of Kroger’s in Perrysburg. It was a very low energy moment for me, and the gift of the pink roses proves that Karma and the spirit of JBN (Just Be Nice) is so very real. You are currently browsing the Kaylynne50's Blog blog archives for April, 2010.